In general, the proposed network, the justifications for it, and the presentation of it is excellent. It is quite evident that a high degree of work went into it, for which the author should be commended. In particular, I admire the presumption of and need for seamless Leap ticketing with single pricing for connecting journeys - this feels a right minded and contemporary approach. On the topic of Route Numbering, I believe consideration should be given to the overlap with Luas, DART & future Metro. These are all Dublin focused services, and the strategy for travellers espoused in the BusConnects report is that they should not differentiate between bus, tram or DART when "charting a course" to their destination. 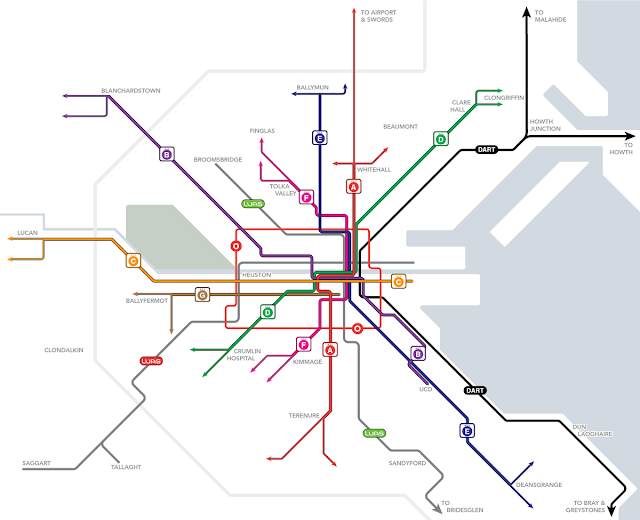 Accordingly, it would be easier for the end user if all of the transport in the city was unified under a common naming & numbering strategy, instead of different concepts (Bus: Number & Letters; Light Rail: Colours with destination text; Heavy rail: Service family name). 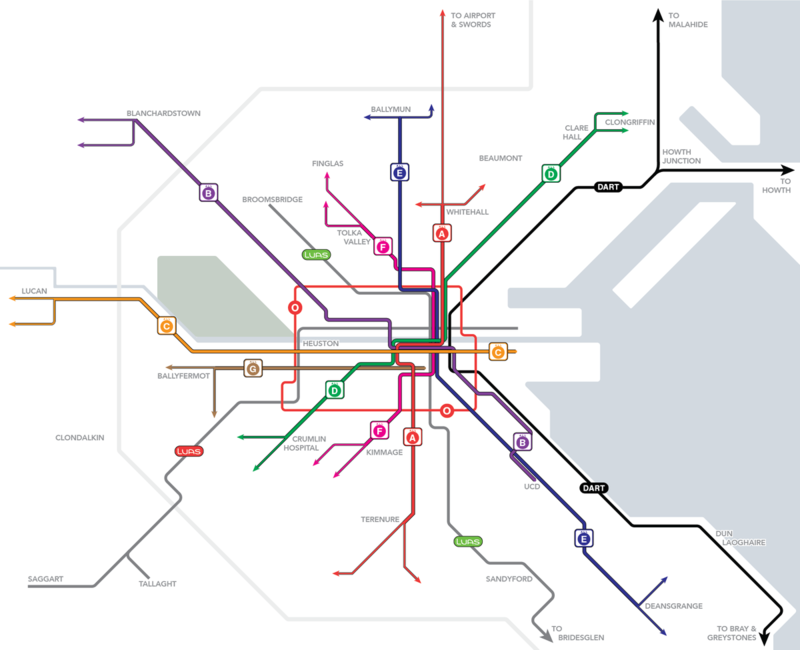 The above recommendation would be difficult to direct solely from a bus orientated network scheme, however considering that the Dublin Bus service contains the highest quantity of unique routes, it makes sense that it should take the lead in numbering for the rest of the city. In terms of the route names & numbers chosen, I query how does it link up with national strategy? For example, Aircoach have their routes in the 70X series, JJ Kavanagh appear to be in the 6XX, 7XX or 8XX series etc. ( https://www.aircoach.ie/timetables & https://jjkavanagh.ie/timetables/ ) Given the interconnected nature of our travel networks, it would make sense to not overlap with other numbered services, so as to ease route planning for travellers - many of whom will either be tourists or the growing carless youth, using Google Maps ( https://www.irishtimes.com/news/technology/google-launches-public-transport-mapping-for-ireland-1.1609265 / http://maps.google.com/landing/transit/cities/index.html). Again, this is a difficult "nut to crack" in context of Dublin focused bus network planning, however a good first step would be to not overlap with existing services, even if for historical purposes Dublin Bus interested stakeholders might wish to retain some route numbers, such as with the 7. For the "other radials" type of route, such as the 7, why not just refer to them as spines? My concern is that too many different route types might cause confusion. From reading the report, it seems that the intent is to distinguish between the frequency of the spines and radials with spines being much more frequent, but is that sufficient cause to introduce a different naming strategy? It seems that the frequency of all services will be such that people need not care about their timetables and instead hop on and off at interchanges to take the bus they need to connect to their destination. On the topic of the specific routing, I am concerned that the peak only services might potentially detract from the normal spines & radials. In line with the point made in the report about not diluting ridership across multiple duplicate routes: Why not just provide an all day radial with reduced mid-day frequency, merged with existing radials? Or possibly re-number them to represent their UCD centric service for example (like U1, U2 etc.). The integration with the other Dublin services such as Luas & DART is commendable, including inclusion of these services with the isochrones in calculating outcomes for travellers. However, I note in the Summary report on page 4 that other services are not included. In the strongest possible terms I believe this omission is short sighted, particularly in the case of Bus Eireann. This should be addressed, as Bus Eireann have a sizeable population of people arriving to Dublin each day, which is likely to grow due to the continued sprawl of Dublin commuters further from Dublin where homes are more affordable ( https://www.independent.ie/business/personal-finance/property-mortgages/families-priced-out-of-property-market-as-a-third-of-income-needed-for-mortgage-36005697.html ). The cohort of people buying houses outside of Dublin and travelling in via Bus Eireann today will likely have children travelling in to Dublin in future, adding to existing ridership of Bus Eireann. Accordingly, it would be prudent to consider interconnections with the Bus Eireann network, and also when making calculations of bus imposed traffic density in Dublin City Centre (per page 146 in chapter 7) . Otherwise there is a risk that the calculations made are not representative of reality, and thus when put into practice, will be based on unsound assumptions, and prone to causing road traffic overloads. Of the spines indicated in the network design, all of them with the exception of G pass close by to Busaras - this should be addressed somehow by considering routing G closer to Busaras (at the risk of greater traffic imposition on the quays). This will make it possible for riders from Ballyfermot to easily connect to Bus Eireann services with only one connection (for example there is frequently student accommodation in Kilmainham areas on the G spine - they could travel home to the rest of Ireland with luggage with ease). Additionally, from a brief & non-detailed perusal of http://www.buseireann.ie/pdf/1424345990-BE-English-Network-Map-Jan-2015.pdf , it can be seen that there are 5 principle coridoors for incoming routes - when the suburban interchanges are being designated, interconnectivity with these coridoors should be a requirement. I note for example the emerging Liffey Valley interchange point is a stop on the west bound Bus Eireann services already. It is conceivable that Bus Eireann travellers might wish to connect to spine services rather than travel to the city centre in order to meet their final destination. And otherwise, even if Dublin Bus don't wish to consider interconnection with specific Bus Eireann services, they could at least consider interconnection with the Bus Eireann hub at Busaras. There are other services which operate in the Dublin metropolitan area, for example Aircoach or Dublin Coach with their Dundrum - Airport service ( https://www.dublincoach.ie/timetables-fares/dublin-airport-dundrum-luas-bus.php ). These services have become successful in part due to exploiting weaknesses in the Dublin Bus service provision. If the current services are not considered in the report, it may nevertheless be prudent to consider the likely ridership that these services carry in terms of overall passengers and routes travelled, for completeness of information in laying out the Bus Connects routes. As covered in the report, it is likely that some locations will emerge as more heavily trafficked interchange points. This is a somewhat unfamiliar concept to many current and potential Dublin Bus travellers, and likely planners etc. Accordingly, some greater guidance to planners on what facilities needed at these more prominent interchange locations might be helpful, to enable them start planning now e.g. car drop off for locals, rain shelters, provision of a shop space (or locate at existing shopping centres), buggy access to move between buses, secure bicycle lock up etc. Dublin, like many cities, has issues with anti-social behaviour / loitering in certain parts of the city ( http://www.thejournal.ie/tourist-crimes-3973767-Apr2018/ ). This should be considered in both the choice of interchange location, and also in terms of the configuration of those interchanges, by provision of adaquete lighting, CCTV, potential for passing activity or overlooking shops etc. Otherwise, people will be reluctant to get out of the "safety" of a bus, undermining the reliance upon connectivity to complete bus connections. As noted, interconnecting will be new to many people - I believe in the early years of this Bus Connects revised network, travellers will need some assistance & guidance on interchanging. This may incur possibly increased dwell time at stops that are prominent interconnection stops, along with very clear and good signage / sightlines to buses etc. This network re-organisation represents a radical change to the existing service provision. The transition to the new network would need to be well planned, and communicated to the public and other stakeholders. This planning takes a long time. It would be helpful at this stage to list the major steps necessary for the implementation, so that stakeholders can prepare for change (and remember that many stakeholders will be opposed to any change) - what would be the major steps? Make infrastructure improvements? Start running orbital services? Then start running spines & radials etc.? Would this occur on a Bank Holiday weekend or similar? Are there any other prerequisites needed? I suggest that at high level, the implementation be described in the report, to enable planning begin. Otherwise, it will be very difficult to transition to this end product. Share book reviews and ratings with Darragh Rogan, and even join a book club on Goodreads. All work is licensed under a Creative Commons Attribution-ShareAlike 4.0 International License. Simple theme. Powered by Blogger.